Technical architects are also known as IT systems architect. If you are in this position then one of your job is to turn client websites into platforms via using PCs, tablets and mobile phones. In order to do this job well, you should be logical and pay attention to details. What skills required to become a technical artchitect? Companies are not only looking for technical skills to choose their employees for these positions but they also look for commercial awareness. I am a professional Technical Architect with a strong background in IT. 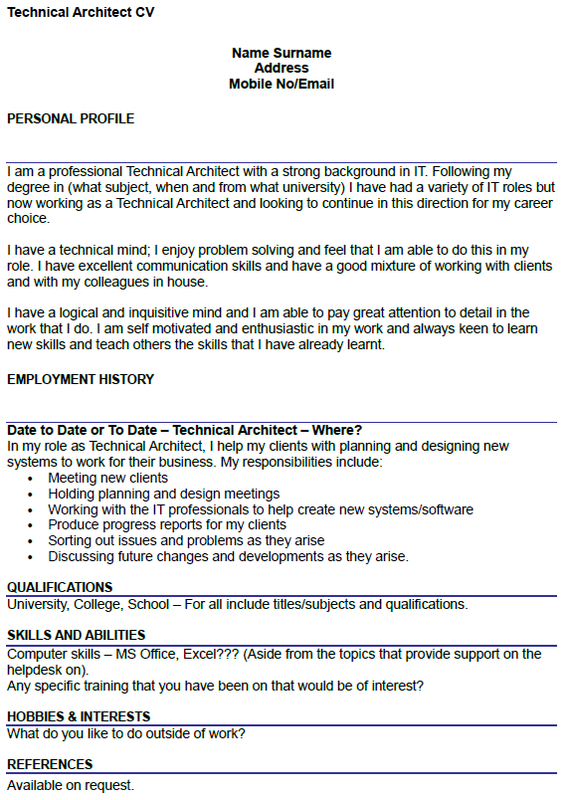 Following my degree in (what subject, when and from what university) I have had a variety of IT roles but now working as a Technical Architect and looking to continue in this direction for my career choice. I have a technical mind; I enjoy problem solving and feel that I am able to do this in my role. I have excellent communication skills and have a good mixture of working with clients and with my colleagues in house. I have a logical and inquisitive mind and I am able to pay great attention to detail in the work that I do. I am self motivated and enthusiastic in my work and always keen to learn new skills and teach others the skills that I have already learnt. Date to Date or To Date – Technical Architect – Where? Discussing future changes and developments as they arise. Computer skills – MS Office, Excel??? (Aside from the topics that provide support on the helpdesk on). Any specific training that you have been on that would be of interest?